Teaching about Climate Change – ETCCC. We begin this blog as President Trump withdraws the United States from the Paris Agreement, after the hottest year ever recorded. Given the seriousness of the climate crisis, we believe now is the time for teachers, especially American teachers, to educate about climate change. We also begin this blog upon the publication of Teaching Climate Change to Adolescents: Reading, Writing, and Making a Difference. Written by ETCCC contributors, Rick Beach, Jeff Share, and Allen Webb, and co-published by Routledge and the National Council of the Teachers of English, this book makes the point that understanding and addressing climate change requires more than scientific facts. Indeed, climate change raises profound moral, ethical, and political questions. Crucial to meaningfully understanding climate change is knowing and empathizing with the experience of others, and using the informed imagination to better understand the past, present, and future. Science has told us that climate change is happening and is human caused. We are sure that science teachers will find ETCCC interesting and useful, but our focus will be on teaching about climate change in the humanities and social sciences, especially in English. Climate change emerges from a specific history and is already having staggering social impacts, with more on the way. Causes and impacts of climate change are linked to global inequality, empire, and unequal development. Global warming requires critically thinking about mass and corporate media. As we consider climate change we need to discern “fake” and “real” news, and investigate how power, money, and politics influence public understanding. Given the danger, teaching about global warming calls for more than passive transmission of knowledge. Among other things, students and teachers can write creatively and persuasively using traditional, new, and social media. 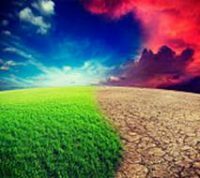 Understanding the social causes and implications of climate change and the moral and ethical issues, and social, cultural, and political issues it raises. Enabling and empowering teachers and students to educate others, participate in mitigating and adapting to climate change, and create a just and sustainable future. Even though the effects of climate change—rising temperatures, warming / acidification of oceans, sea rise / flooding, droughts, and extreme weather events—are increasingly evident, many people still do not understand the profound implications of climate change, nor perceive the need for immediate action. Unfortunately, in America climate change has become a divisive, partisan issue pitching Republicans against Democrats. Yet climate change is profoundly non-partisan. At 3ºC of global warming the Sahara Desert is expected to extend to the middle of France. Though the most vulnerable will suffer first, climate change will impact people regardless of race, nation, or party affiliation. Instead of divisiveness, addressing global warming calls for national and international cooperation. Works of climate fiction, “cli-fi” as the genre is called, are useful for teaching about climate change not just in English classes, but in many disciplines. As they discussed the story, Maddie Reeves commented on the “gated off” areas for the “privileged.” Lauren Koch pointed out that the inequality of our own time becomes, in the aftermath of climate changed depicted in the story, even more extreme. Jake Peters commented that the story might change people’s perspectives on money: the main character as a young man was wrapping up in getting ahead financially at any cost, but as an older man he regrets his choices. The story portrays social violence and includes profanity, but the disturbing aspect of the story is the dystopic breakdown of the social order under climate change stress. Climate scientists make predictions about temperatures and weather events. The story invites us to consider values, crumbling social structures, the relationships between generations, and the implications of present day decisions for life in the future. A motif in the story is “paying attention to warning signs,” and that opens up inquiry into climate change “warning signs” in today’s world, and how we, in the present, might pay attention and act so as to avoid the dire future the story foretells. The scientists and engineers have done their work, providing a timely warning on climate change and producing the technologies like solar panels that would help take it on. It is the rest of use that have so far failed, and it’s largely a failure of…imagination, precisely the reason we have English class. This book will help many teachers understand their craft in light of the planet’s great crisis. It is our ambition that ETCCC will publish posts every other week. We invite you to subscribe, and to contribute. Previous Post Previous post: Welcome to ETCCC! Next Post Next post: How Serious is Global Warming? Pingback: Climate Change and the Imagination – ETCCC.